Paris COP21: Seattle-style shutdowns or another climate cul de sac? 400,000-strong climate march, New York, September 21, 2014. Click for more on the struggle against climate change. Nnimmo Bassey (centre). Photo: Right Livelihood Award Foundation. November 2, 2011 -- It’s unlikely there will be "an equitable outcome" from the COP17 climate talks, to be held in Durban in December 2011, but it will be "a great moment to intensify campaigns against the business-as-usual manner" in which climate negotiations have been conducted so far, Friends of the Earth International's Nnimmo Bassey told Pambazuka News. 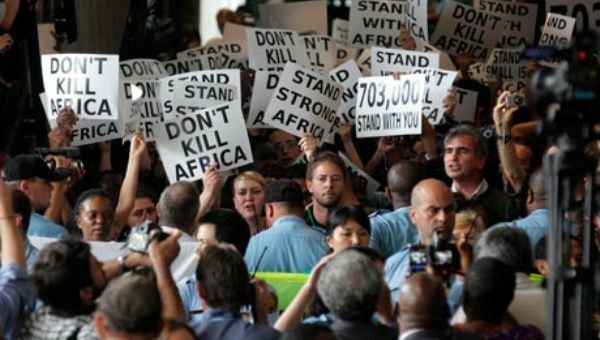 June 12, 2011 -- Reports from the Economic Front, posted at Links International Journal of Socialist Renewal with the author's permission -- More than 3000 participants from 183 countries are attending a two-week UN sponsored climate gathering in Bonn, Germany. The talks are supposed to help prepare the agenda for COP 17, or as it is more formally known, the 17th Conference of the Parties of the United Nations Framework Convention on Climate Change (defenders of the environment have renamed the meeting the Conference of Polluters) which will take place November 28 to December 9, 2011, in Durban, South Africa. June 21, 2011 – Links International Journal of Socialist Renewal -- Judging by what transpired at last week’s global climate negotiations in the former West German capital, Bonn, it appears certain that in just over five months’ time, the South African port city of Durban will host a conference of climate procrastinators, the COP 17 (Conference of Parties), dooming the Earth to the frying pan. Further inaction on climate change will leave our city’s name as infamous for elite incompetence and political betrayal as is Oslo’s in the Middle East. Stand up for Africa! Stand up for climate justice! June 4, 2011 -- From May 24 to 26, 2011, representatives of African trade unions, farmers, women and faith-based groups, as well as key African non-governmental organisations and networks concerned with the climate change crisis met in Johannesburg, South Africa, to discuss shared strategies to confront this crisis and its root causes. Under the joint sponsorship of the Africa Trade Network (ATN), the International Trade Union Confederation-Africa (ITUC-Africa) and the Pan African Climate Justice Alliance (PACJA), the meeting deliberated on the threats posed to the peoples of Africa and the world over by climate change, as well as the continuing inaction by governments in the face of these threats. The meeting reached shared understandings and adopted the conclusions that follow. প্যাট্রিক বন্ড কানকুন সম্মেলন : সবাই হারলো, জিতলো কেবল পুঁজিবাদ? Activists from Via Campesina, an international movement of peasants, demonstrate during the United Nations Climate Change Conference in Cancun, Mexico, December 7, 2010. Photo AP/Eduardo Verdugo. December 16, 2010 -- Transnational Institute -- In the famous Hans Christian Anderson fable, "The Emperor's New Clothes", a weaver famously plays on an emperor's arrogance and persuades him to wear a non-existent suit with the argument that it is only invisible to the "hopelessly stupid". 12 de diciembre -- Bolpress/Links International Journal of Socialist Renewal -- La clausura el 11 de diciembre de la 16 Conferencia de las Partes –la cumbre global del clima– en Cancún fue mostrada por la mayoría de los participantes y periodistas de los medios dominantes como una victoria, un ‘paso adelante’. El jefe negociador del Departamento de Estado de EE.UU., Todd Stern, alardeó: “El año pasado las ideas fueron esquemáticas y no se aprobaron, ahora se han elaborado y se han aprobado”. Red Road Cancun, by Allan Lissner. Highlighting Indigenous voices excluded from the COP16 UN Climate Conference in Cancun, Mexico. December 11, 2010 -- Cancun, Mexico -- The Plurinational State of Bolivia believes that the Cancun text is a hollow and false victory that was imposed without consensus, and its cost will be measured in human lives. History will judge harshly. November 27, 2010 – At the next meeting of the Conference of Parties to the United Nations Framework Convention on Climate Change (COP 16), which begins November 29 in Cancun, Mexico, the 192 member states must agree on a second commitment period of the Kyoto Protocol. However, on November 24, the president of the Ad-Hoc Working group on Long-Term Action issued a new document that attempts to legitimise the “Copenhagen Accord”, which the United Nations merely “took note of” last December in Denmark. This new document put forth by the president of the Ad-Hoc Working Group, instead taking into account the proposals of all the parties put forth during the process of negotiations, downplays the need for a second commitment period of the Kyoto Protocol. [The latest document] was developed underwithout the mandate from the parties, and promotes emissions reductions by all countries without clearly distinguishing between developed countries and developing countries, leaving aside the fundamental principle of “common but differentiated responsibilities” among nations. 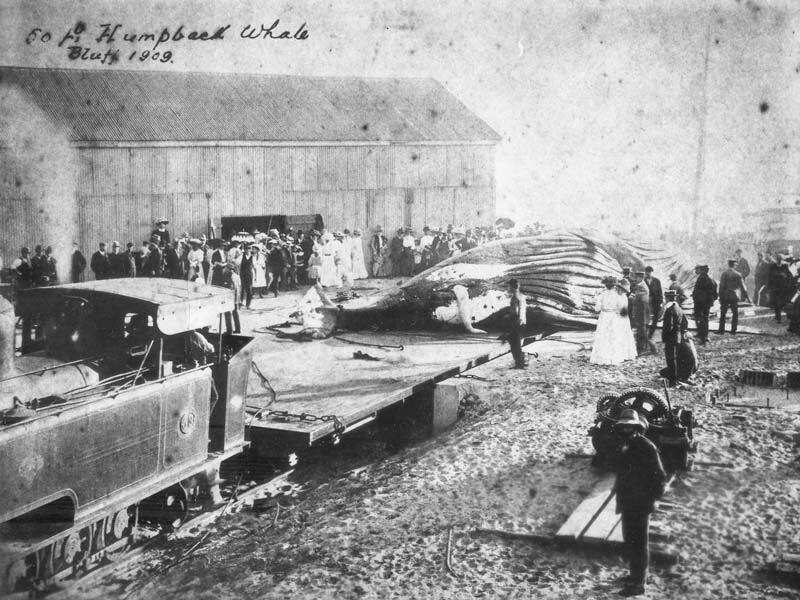 A humpback whale at the Bluff Whaling Station, South Durban, in 1909. From "Facts About Durban". November 23, 2010 -- Links International Journal of Socialist Renewal -- The stench of rotting blubber would hang for days over The Bluff in South Durban, South Africa, thanks to Norwegian immigrants whose harpooning skills helped stock the town with cooking fat, margarine and soap, starting about a century ago. The fumes became unbearable, and a local uproar soon compelled the Norwegians to move the whale processing factory from within Africa’s largest port to a less-populated site a few kilometres southeast. There, on The Bluff’s glorious Indian Ocean beachfront, the white working-class residents of Marine Drive (perhaps including those in the apartment where I now live) also complained bitterly about the odour from flensing, whereby blubber, meat and bone were separated at the world’s largest onshore whaling station.